Escape on one of our spa breaks to County Durham. Explore this amazing County on a weekend or midweek break. With breath-taking scenery, award-winning attractions and world-class exhibitions, festivals and events you’ll never be short of something to do. 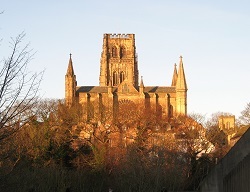 A spa deal in Durham would bring you to this fantastic city located in the North East of England which is home to the magnificent Durham Cathedral. Together with adjacent Durham Castle, this UNESCO World Heritage Site forms one of the most stunning city panoramas in Europe. Seek out hidden gems in market towns and villages. Relax and enjoy peace and tranquillity of the beautiful countryside. Getting outdoors on your spa break is not a problem in County Durham as there are plenty of walking and cycling routes in the area with unforgettable views. Great value breaks in the county are easy to come by, with two superb venues in the area we will be sure to find you your prefect spa break. The Redworth hall is something of a site for sore eyes, this beautiful venue surrounds its self in 150 acres of woodland making it the perfect place to retreat into a peaceful and relaxing surrounding. We also have the Hall Garth Hotel & Spa offering comfortable accommodation and great spa facilities. Originally part of the Bishop of Durham's estate this venue will definitely please any future guests. Unwind in your spa hotel with a spa treatment and a gentle swim in the pool. In the evening enjoy some delicious food in the relaxing surroundings of your chosen hotel. The staff at all of our venues are there to cater to your ever need so don’t be afraid to ask should you require something in your room or as part of you spa treatments to make your spa break extra special. To check availability at one of our spa break venues, please call us on 0800 012 2000. Beautifully set in 20 acres of Northumberland countryside and overlooking the Derwent Valley, BEST WESTERN Derwent Manor Hotel offers the warmest of welcomes. With its country house ambience, elegant decor and professional team, this is the ideal venue for business and leisure guests alike. Derwent Manor Hotel boasts 48 spacious en-suite bedrooms with many having timber-beamed ceilings and stunning views over. . .
Offering the perfect blend of traditional features, luxury accommodation and first-class service, Ramside Hall is the ideal setting for a break in County Durham. Situated on the outskirts of Durham City, the hotel boasts 127 luxurious bedrooms and suites, each offering its own unique charm with stunning views across 350 acres of beautiful private grounds. Once you’ve relaxed into your. . .